it is advisable to use this route to create your acquisition. In the Purchase Order details page, click Receive > Quick Receive. EMERGE automatically creates a stock receive with all purchase order items using system defaults. In any circumstance when not all goods can be received from your supplier, perhaps due to shortages of stocks or receive is intended to be divided into multiple trips, you may create a partial acquisition manually. (You may create a full stock receive manually as well). In a manually created stock receive, you are able to include more than 1 purchase order from the same supplier into a single stock receive. This comes in handy when a several stock purchases arrive at the same time. You can then choose to receive the goods in one single acquisition, holding the stocks from all purchase orders into it. See Select items to receive below. Once you have completed filling up the fields, click Save. The new acquisition will be displayed in the acquisition listing page. Location – The stock location where the good(s) are stored. Batch(If applicable) – The batch of the stock(s). Qty – The quantity received. If you have multiple stock locations, it is important to select the destination warehouse for each item. 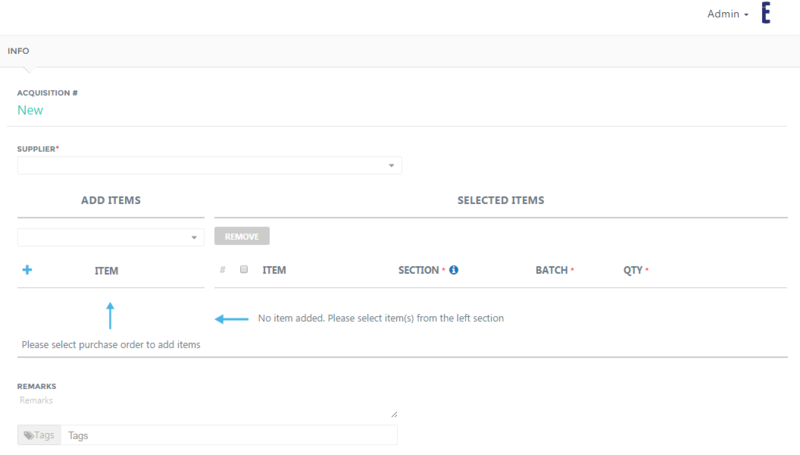 Once you receive items, confirm your acquisition and your stock quantity will automatically be increased. Once the acquisition is confirmed, amendments cannot be made to the document. In the Acquisition detail page, click Receive at the top right corner. When the acquisition is created, you can print / email / download your stock receive in PDF format by clicking the respective icons located at the top part of the details page.